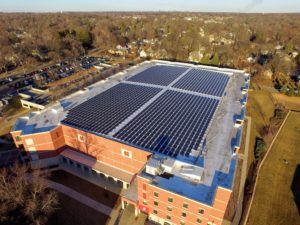 An update on this solar and 250 kW battery storage project in Naperville, IL. Convergence-Energy has completed the solar installation and the battery has been crane-lifted to the corner of the building (picture right), installed and connected. Power services to the building, Market participation and revenue generation will start in March. This entry was posted in North Central, Projects. Bookmark the permalink.